Rogers Place looms large behind Julian Daly, as he clips on a microphone for a media interview outside of Boyle Street Community Services at the edge of Edmonton’s downtown. Rogers Place looms large behind Julian Daly, as he clips on a microphone for a media interview outside of Boyle Street Community Services at the edge of Edmonton's downtown. The new arena, set to open Sept. 8, is practically in the front yard of the social agency's headquarters. The contrast between the neighbouring facilities is striking. 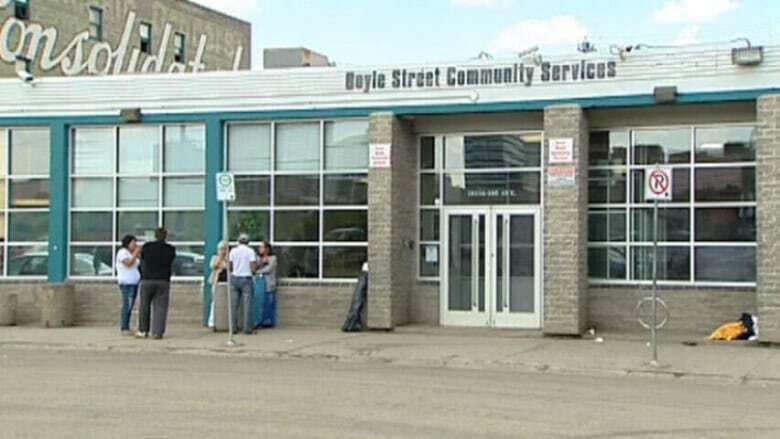 Boyle Street Community Services helps people who struggle with homelessness, addiction and abuse. The arena is owned by the city and operated by the Oilers Entertainment Group (OEG). Funding for the $604-million project was a mix of public and private money. Daly, Boyle Street's executive director, said his clients have seen few benefits from construction of Rogers Place. "It would have been great to see some of the folks that are currently homeless and without employment that we serve get those opportunities," he said. "And also it would have been great to see some housing opportunities, affordable housing, built in this community for people who are homeless and have nowhere to live." Twelve people from Boyle Street's Water Wings employment readiness program worked on Rogers Place construction site and the adjacent entertainment area that has been branded the Ice District. Another 10 people from other social agencies and programs, the Bissell Centre, Centre High and the province's Registered Apprenticeship Program, were also involved. In June, 17 people were hired through a job fair involving 32 inner-city community and social agencies. The Oilers say 175 people from inner-city neighbourhoods were hired for part-time food and beverage jobs at Rogers Place. In total, about 1,600 people, mostly part-time, will work at the arena once it opens. But some community representatives are now asking whether the Oilers have done enough for the people who live in the inner-city neighbourhoods that surround Rogers Place. The arena's opening has renewed focus on the community benefits agreement contained within the arena master agreement signed by the City of Edmonton and the Katz Group in August 2013. Schedule D is a one-page document that sets out the terms of the community benefits advisory committee, as well as how the Oilers will endeavour to be a good neighbour to adjoining communities by addressing concerns about parking and noise. However, the language used in the document is vague. There are no targets set for how many local people will get jobs, no cost figures to train disadvantaged people. There are no commitments to build housing for people who are homeless or displaced by development around the facility. Instead, the agreement simply states the Edmonton Arena Corporation "will use their best efforts to encourage job training and employment programs targeted at low-income and high needs residents of downtown Edmonton communities during the construction phase and operations when the arena is complete." The agreement also contains an acknowledgement by the city that the Edmonton Oilers, through its foundation, has funded charitable initiatives throughout the community. CBC News wanted to talk to the Oilers Entertainment Group (OEG) about the wording of the agreement. 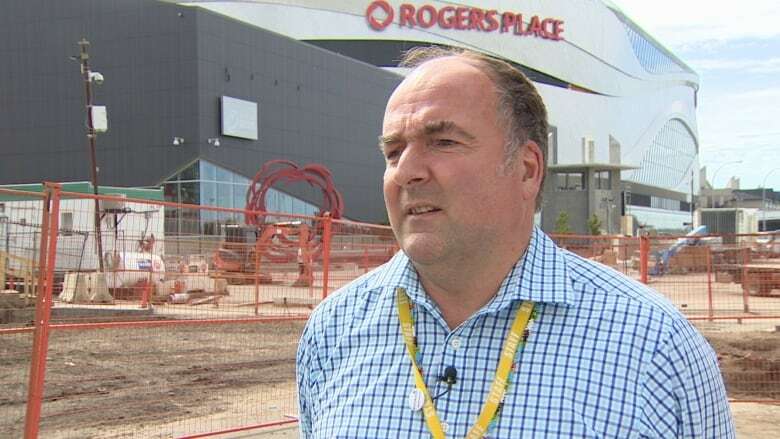 However, an interview set up with Susan Darrington, vice president and general manager of Rogers Place, was cancelled by the organization following publication of a news story containing comments from critics of the community benefits. In a technical briefing on Aug. 19 representatives from the Oilers Community Foundation and the Oilers Entertainment Group laid out what they've done for the community over the past 15 years. The foundation claims it has donated $30 million to the community since it was founded in 2001, with $10 million invested in agencies that deal with inner-city issues. The team also points to $1.5 million being spent on a hospitality training program it set up at Norquest College as another way it is helping people get jobs through the arena's development. The organization has allocated another $1 million for programming at the Rogers Place community rink. While the majority of jobs at Rogers Place will be part-time, OEG is looking at providing them subsidized transit, meal benefits and parking. These initiatives, according to Tim Shipton, vice president of corporate communications and government relations for OEG, "don't just meet but exceed our obligations and responsibilities as it relates to the community benefits and community improvement." The Oilers say Edmonton is also benefiting from the adjacent developments that Katz has helped fund. Shipton said that is contributing to the tax base and revitalizing downtown Edmonton. Boyle Street Community Services sits behind Rogers Place in downtown Edmonton. Community advocates like Daly point to community benefits agreements signed in the United States and United Kingdom that have more specific targets. In Vancouver, the construction of General Motors Place sparked an initiative to hire local people for construction jobs in 1994. The B.C. government agreed to hire a set number of workers from the inner city to build and operate that arena. Jim Green, a community activist who later became a Vancouver city councillor, formed a group called BladeRunners to help prepare at-risk young adults for work on the construction sites. Since then, community benefit agreements have been a part of many Vancouver developments, including the construction of the athletes village for the 2010 Winter Olympics. Raymond Louie, a five-term city councillor and Vancouver's acting mayor, said benchmarks and targets are an important part of these agreements. "With the clarity of targets, everyone understands what their activities need to be in order to meet those targets," he said. Louie said cities negotiating deals for large-scale projects should consider the economic, social and environmental impacts as a whole. Crafting an agreement with specific targets creates more work at the beginning, but saves money in the long-term. "The benefits are significant on the back end," Louie said. "Certainly just on a pure economic basis, [it's] cheaper to give the person skills and opportunities to benefit themselves rather than continuing to support them on welfare." Louie adds that society also benefits when people are able to support themselves. Rick Daviss, the city's executive director for the arena project, said Edmonton's agreement lacked those specific targets because no one asked for them. "There was never any discussion about the targets from either the community groups or the city," he said. But Daviss said an agreement with too many specifics can stymie efforts to work with the community. "Having to tie yourself down to a binding agreement actually limits your ability to evolve and react to bigger issues or large benefits that might occur," he said. Daviss said he wishes the number of disadvantaged people who worked on Rogers Place was higher. But he says the arena kept many people working during the province's economic downturn. "On the one hand, I was a little disappointed in the numbers, but when you considered it in the overall context of the economy of the city and the province, I think it's still pretty substantive that we had any hires," he said. However, some community leagues have renewed a push for affordable housing and jobs with living wages. They want to negotiate a new binding agreement with Katz. Several community representatives are going to the city's executive committee Tuesday to ask for councillors' support for action. While he wishes them well, Daly said the push comes way too late in a process he calls a disappointment. "It's a real lost opportunity for the Edmontonians that live and work in this area," he said.